Located on the strip in the heart of Reno's new restaurant and shopping district. Just minutes from the airport, downtown and the National Bowling Stadium less than an hour from beautiful Lake Tahoe and historic Virginia City. 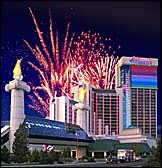 This Resort is also located directly across the street from the Reno Sparks Convention Center. This Resort features 1,000 beautifully appointed rooms with dazzling city and Sierra Nevada mountain views. The World Class Casino features unique tropical and indoor water features that creates excitement with the newest and most popular slot and video poker selections. Entertainment is plentiful with Cabaret entertainment, the State-of- the- art Atlantis nightclub and the Entertainment Family Fun Center. The Atlantis features seven exceptional dining choices. Toucan Charlies Buffet and Grille- voted best of Reno. Monte Vigna- Italian Ristorante with private dining rooms, and spectacular wine cellar. Xanadu- The exotically themed Cocktail Lounge The Sky Terrace- Fresh Oysters and other wonderful delights served with beautiful views of the Sierra's. Java Coast Expresso Lounge and Pastry Bar - for the early risers or afternoon snacks freshly made. Atlantis-Casula fine dining Seafood and Steakhouse. Cafe Alfresco voted the best brick oven pizza and salads.